Monday, March 1, 1858.Clinton, IL. Wednesday, March 3, 1858.Clinton, IL. 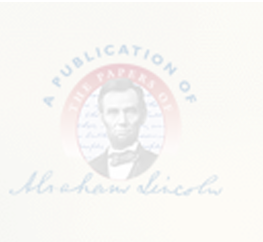 Lincoln writes and files demurrer in Allen v. Illinois Central, signing "Moore & Lincoln p.d." Record. Thursday, March 4, 1858.Clinton, IL. On Lincoln's motion, sheriff's return in Allen v. Illinois Central is quashed. Record. Monday, March 8, 1858.Clinton, IL and Springfield, IL. Lincoln sits as judge pro-tem on 20 cases in DeWitt Circuit Court, writing "Judge's Remarks" in judge's docket. Record. Returning to Springfield by train, he receives $250 from Daniel Doup, for whom he has chancery case on file, and writes receipt. Photocopy. Lincoln writes to Republican Congressman Owen Lovejoy, of Princeton, Illinois, and claims that he has "an inside view" about the Democrats' plan to persuade a Republican to run against Lovejoy. Lincoln warns some "have been urgently tempted by the enemy; and I think it is still the point for you to guard most vigilantly." Lincoln asks Lovejoy to consider the information "confidential; not that there is anything wrong in it; but that I have some highly valued friends who would not like me any the better for writing it." Abraham Lincoln to Owen Lovejoy, 8 March 1858, CW, 2:435-36. En route to Chicago, IL? Tuesday, March 9, 1858.En route to Chicago, IL? Wednesday, March 10, 1858.Chicago, IL? Thursday, March 11, 1858.Chicago, IL. Lincoln writes Solon Cummins that land case on which he has been intermittently engaged since 1850 has been won in U.S. Circuit Court. Abraham Lincoln to Solon Cumins, 11 March 1858, CW, 2:436. En route to Springfield, IL? Friday, March 12, 1858.En route to Springfield, IL? Monday, March 22, 1858.Lincoln, IL. Lincoln writes to Illinois Governor William H. Bissell to seek clemency for Samuel Jones and James Jones. A Logan County Circuit Court jury "found [them] guilty of stealing five . . . small hogs." Lincoln explains, "I was not concerned in the trial . . . I have been appealed to, to say something in favor of their being pardoned. They are father and son. . . . [Samuel Jones] is an old citizen . . . and his neighbors appear more anxious that he and his son should be pardoned, than I have known in any other case." Indictment, filed 15 March 1858, People v. Jones & Jones, case file; Jury Verdict, filed 18 March 1858, People v. Jones & Jones, case file; Order, 18 March 1858, People v. Jones & Jones, Record 1, 571-572, all in Logan County Circuit Court, Logan County Courthouse, Lincoln, IL; Abraham Lincoln to William H. Bissell, 22 March 1858, CW, 2:436. Friday, March 26, 1858.Lincoln, IL. In the Logan County Circuit Court, Judge David Davis continues the case of Hildreth v. Gill. Lincoln and Lionel P. Lacey represent defendant Thomas N. Gill, whom McCarty Hildreth is suing over the sale of 1,231 hogs.Order, 26 March 1858, Hildreth v. Gill, Circuit Court Record 1, 50; Declaration, filed 3 March 1858, Hildreth v. Gill, case file, both in Logan County Circuit Court, Logan County Courthouse, Lincoln, IL. Lincoln, IL and Springfield, IL. Saturday, March 27, 1858.Lincoln, IL and Springfield, IL. Lincoln and Goodrich represent defendants in Bruner et al. v. Bruner et al., bill to correct mortgage deed. Report submitted is approved and ordered recorded. Record. In Springfield, Lincoln finds among his mail letter from Jonathan Haines of Pekin, client in reaper patent litigation, and one from Alfred Hyde, convict. He writes to Haines about two law suits, one pending, another prospective. "I really can not find time to prepare such a suit, until the Spring courts are over." Abraham Lincoln to Jonathan Haines, 27 March 1858, CW, 2:436-37. Hyde reminds Lincoln of seeing him on train March 4, 1857, and asks his assistance in seeking pardon. Lincoln files Hyde's letter until Aug., when he writes Daniel Dickinson of New York about him. Hyde to Lincoln, 25 March 1858, Abraham Lincoln Papers, Library of Congress, Washington, DC; Abraham Lincoln to Daniel S. Dickinson, 3 August 1858, CW, 2:535. Tuesday, March 30, 1858.Metamora, IL. In the Woodford County Circuit Court, Lincoln and Henry Grove file a plea for defendants Armstrong Goings and Samuel W. Beck in the case of People v. Goings and Beck. Goings and Beck are on trial for allegedly failing to bring before the Court Melissa Goings, whom the state is trying for murder in the related case of People v. Goings. Plea (copy), filed 30 March 1858, People v. Goings and Beck, copy files, IHi, Springfield, IL; Writ of Scire Facias, 1 January 1858, People v. Goings and Beck, Woodford County Circuit Court, Woodford County Courthouse, Eureka, IL. Wednesday, March 31, 1858.Metamora, IL. Acting with Shope for plaintiff in Forney v. L. C. Blakslee & Co., Lincoln agrees to defendants' pleas. Photocopy.